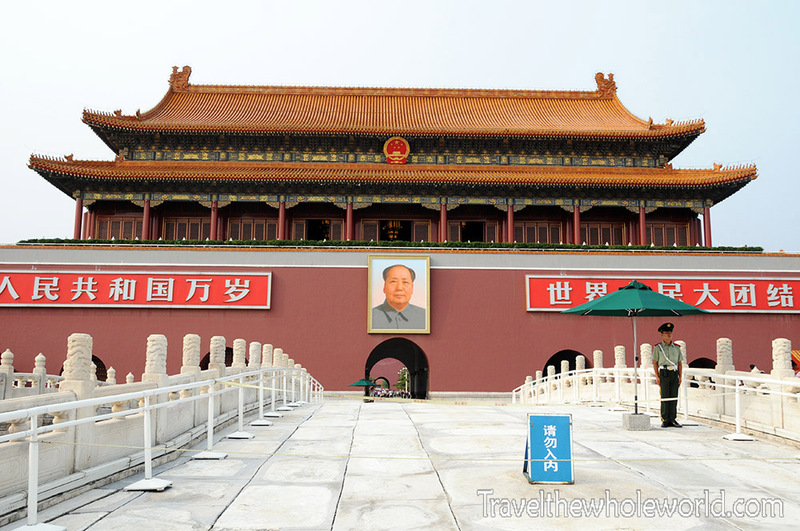 I began my travels in Beijing with Tiananmen Square. 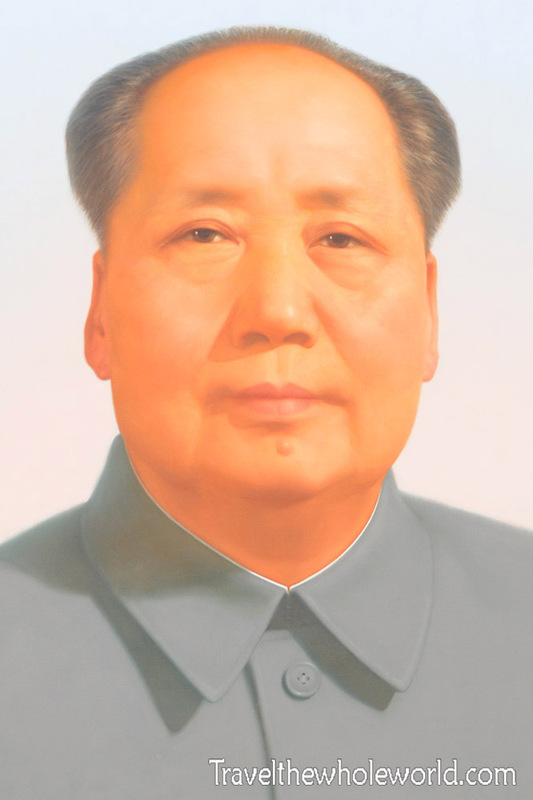 Here I viewed the famous portrait of one of China’s most known and respected leaders, Chairman Mao Zedong, who ruled for over a quarter of a century from 1949 to 1976. Although he is seen with controversy in the west and even within China, he is without question one of the most influential people in the 20th century. 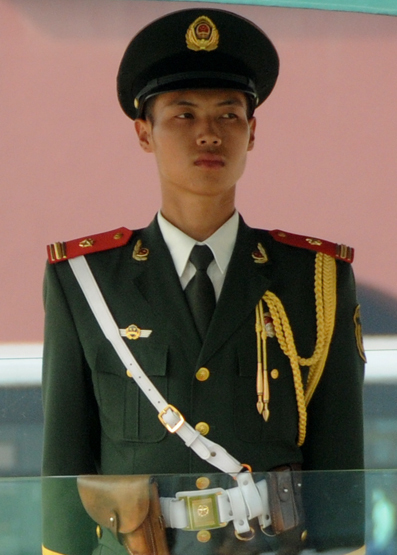 To the Chinese, this is the man who single handily transformed China from a weak nation to a world power. Essentially Mao Zedong created modern day China. Above is Mao Zedong’s Mausoleum, also known as Mao Zedung’s Memorial Hall. 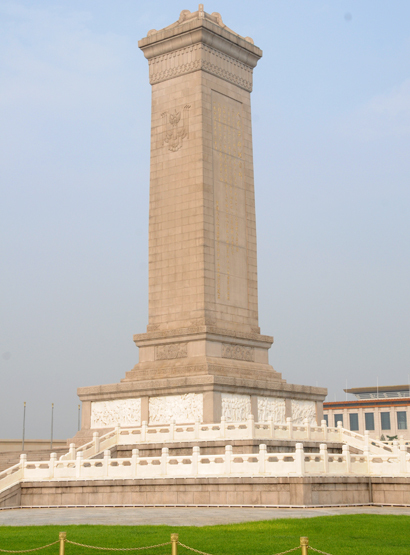 Nearby to this is the People’s Heroes monument. 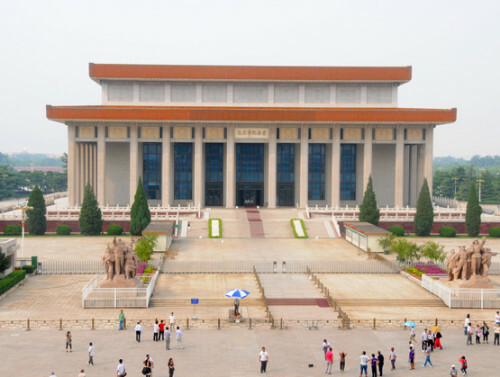 While these modern buildings were built in the 20th century, the Tiananmen gate dates back to the 15th century. Sadly I didn’t enter the mausoleum. As a matter of fact I was distracted by two girls I met here who later ended up scamming me. Out of all my travels, this is the only time I’ve ever been scammed! They approached me claiming to want to hang out to learn English and that they were visiting from another city themselves. They looked shy and innocent and were dressed respectably. I wasn’t naive about their intentions and figured they were probably up to something, but since I didn’t expect them to physically attack me I thought I’d keep my belongings close and see what would happen. I figured their tactic might be to lure me to an alley or some isolated place where others would rob me, so my main concern was to stay in populated areas. For several hours we hung out together and everything seemed quite normal. 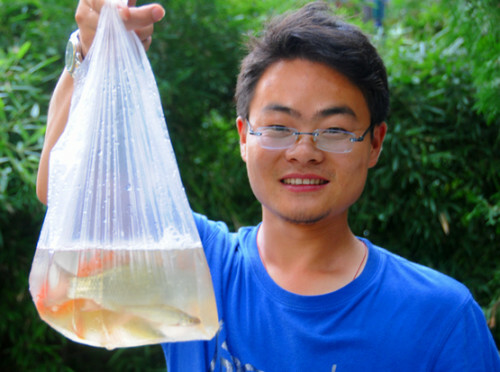 We ended up doing things that most people would do when traveling to a new city. I even began to wonder if I was wrong! Of course it was around that time when I was asked if I wanted some tea. We went to a simple tea shop and all was well until the shocking bill of $100 arrived. They said we should all split it and the two girls put up their share. Then the scam became obvious. There was no photography signs on the walls, no other people where in the tea shop. They would no doubt return later and get their “share” back and then some. I had never been scammed before so instead of arguing I accepted defeat and just paid my portion as well. I’ve always known to check prices before committing to drinks, a taxi ride or any kind of service, but as I said I had let my guard down. The funny thing about the whole situation is I never accused the girls of scamming me. They seriously thought I believed that all was well and we had just had bad luck at an expensive tea shop. After we left the tea shop, they repeatedly apologized and continued to hang out with me for the rest of the day. 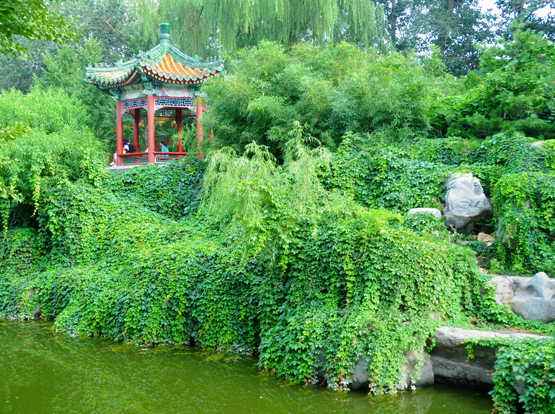 I tried to make the most of this, and the way I saw it I had paid for some translators and a tour by locals of Beijing. When we did go our own ways they apologized many times about the expensive tea and even offered me their umbrella since it was raining. Scam artists with a guilty conscious! 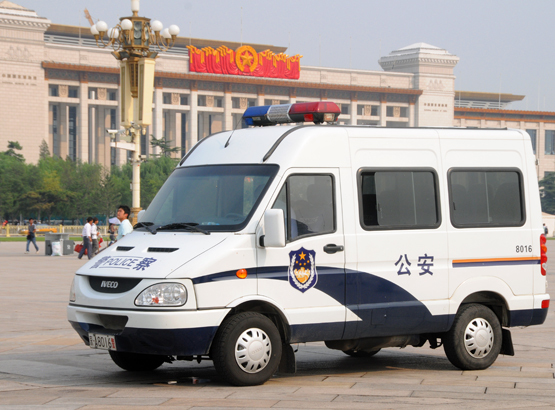 Most of the world is aware of the strict policies of the Chinese government and their censorship. The scam artists girls I had been hanging out with claimed that 80% of Chinese people were unaware of the tank rolling over a man and killing him during the Tiananmen square massacre. I have no idea how true their claim is, but that number seems greatly exaggerated to me. From my understanding things have changed drastically in the past few decades. There is still lots of information kept from public, many events censored, and several websites (including my own!!! ), that are blocked from general citizens. If I was around in the 70’s or 80’s as a traveler I wouldn’t have attempted to take the photos above of the guard and the police car on the right. 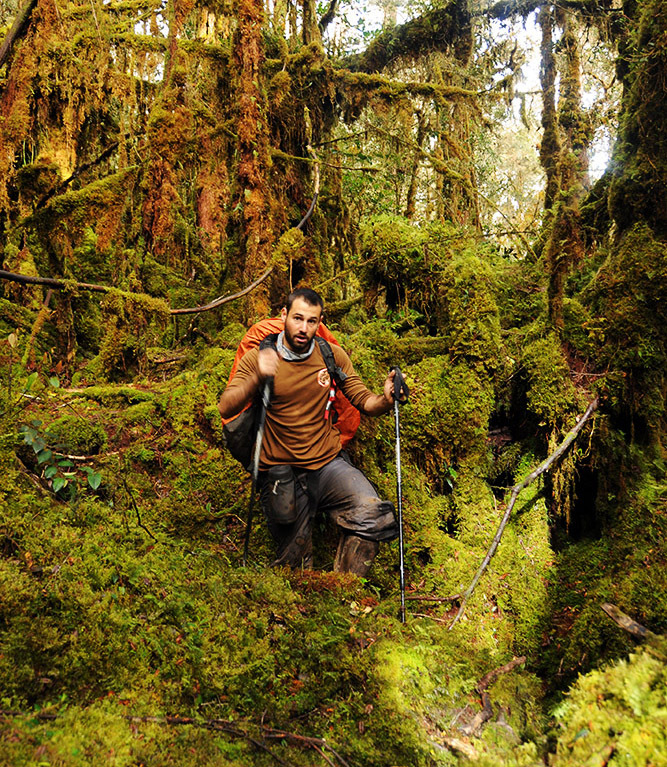 As a traveler the country seemed relatively normal from my own experiences, and who knows how much more change they will see in a decade. 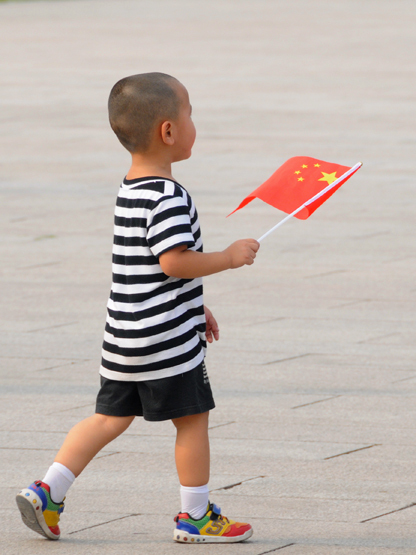 Patriotism was very high in Tiananmen square. 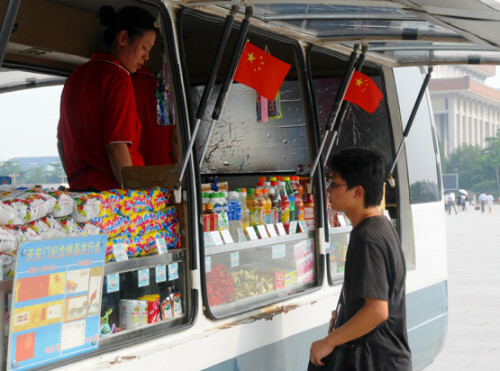 Above is a little boy with a Chinese flag and on the right a food stand selling drinks snacks and Chinese flags as well. Of course the patriotism isn’t limited to Beijing. Throughout China I saw people proudly displaying Chinese flags. Perhaps that might die down a bit as you head further and further west to where several regions want to be independent such as Tibet and the Uighers. These surrounding photos are of a small park right outside Tiananmen Square. The parks were well taken care of and peaceful to walk through giving me a break from some of the over crowded traffic jammed streets. The only exception to the peace in the park was when I heard some yelling and saw a kid sprinting through the park who dropped a bag on the way. 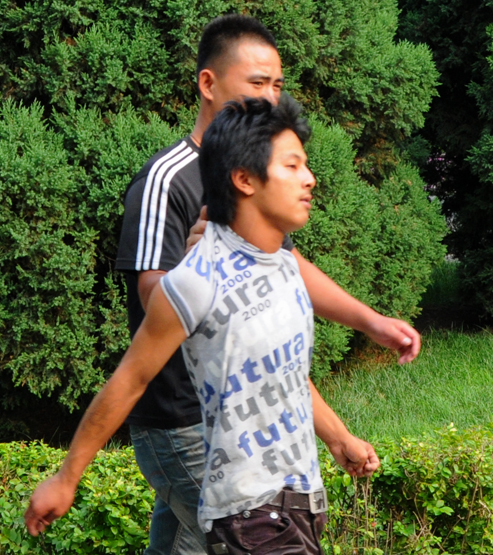 Apparently he had tried to steal from someone but was caught by the man holding his shirt above. I’ve no idea what kind of punishment he will get but I imagine it would probably be worse than a western country. The guy below was also possibly breaking laws; he had proudly gone fishing right here in the city park! palace is made up of almost 1,000 buildings and nearly 9,000 rooms. After its completion in the early 15th century it served as the seat of the both the Chinese government and various emperors for the next 500 hundred years. 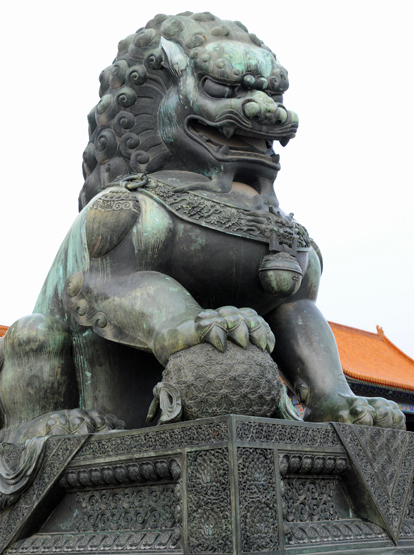 The final ruler of the Forbidden City was Emperor Aisin-Gioro Puyi, who’s story marked a sad end to the Forbidden City’s traditions that had spanned several centuries. As the new Republic of China’s government grew ever more powerful, Puyi completely lost rule as Emperor in 1914. Eventually he was given a small short lived roll in the new government that lasted until he was overthrown in a coup in 1924. 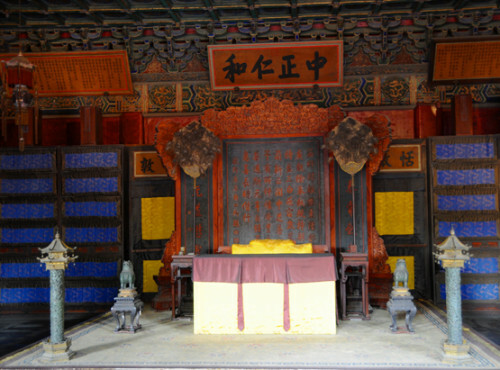 Only a year later Puyi’s former life and home became a massive museum known as the Forbidden City. 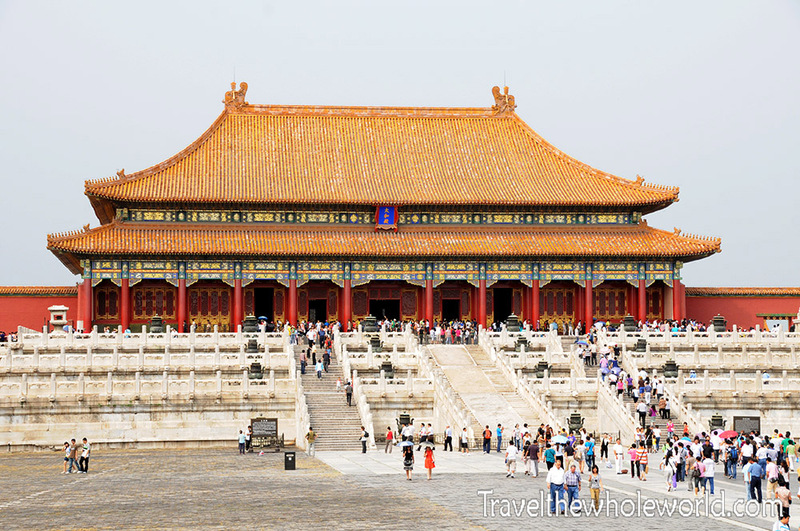 I was aware of the Forbidden City’s vast size but must admit when I first entered and saw the open courtyards at first I was a bit disappointed. Of course it was stupid of me to make such an impression after only a few minutes in the palace. It wasn’t until I began to wander through the side alleys and different rooms that I realized how amazing this place was. What an achievement it was to build this city nearly 600 years ago and have it last for half a millennium. Above are examples of past uniforms and the inside of one of the thousands of rooms. 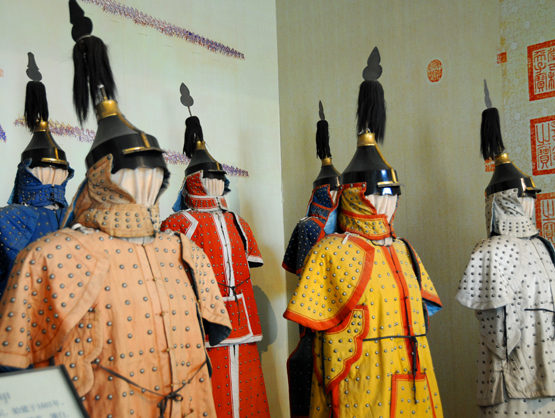 These four surrounding pictures are all from the Forbidden City as well. Above shows some of the architecture and sculptures they created. 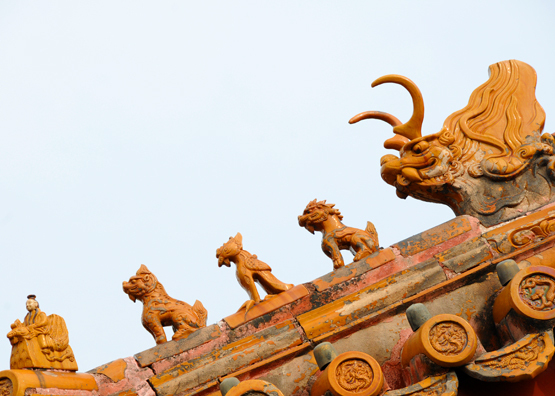 A dragon statue on the left and some more smaller dragons on the corner of a roof. 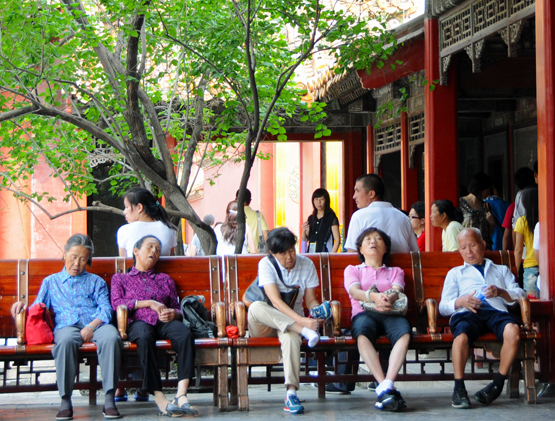 There are several courtyards and places to rest inside the Forbidden City. 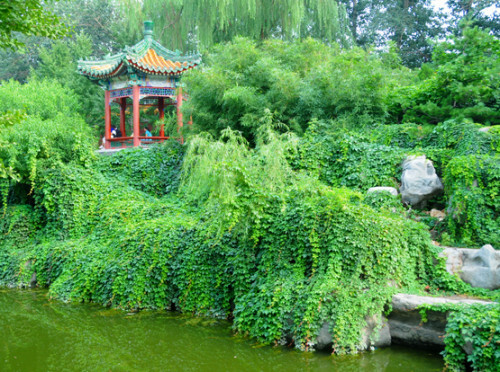 Below is a large ivy covered tree on the left and a bunch of older Chinese tourists that looked like they had their share of walking for the day. 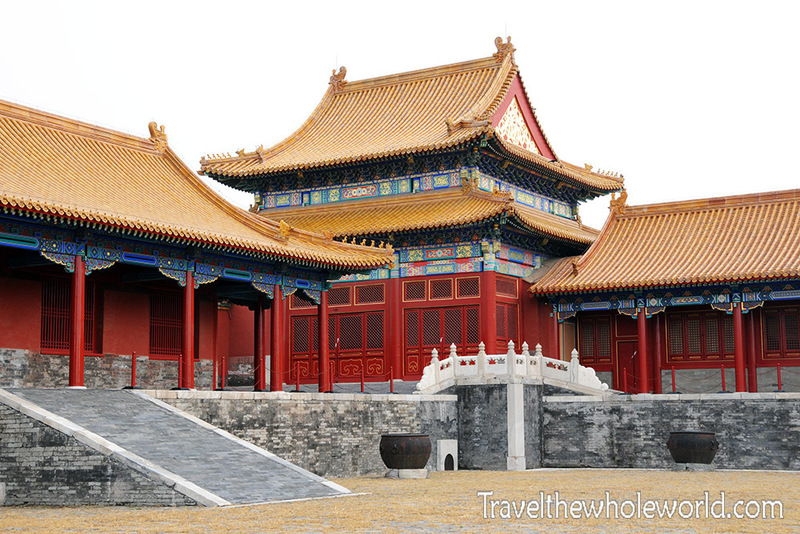 With so much history in this place I could easily dedicate a page solely to the Forbidden City. 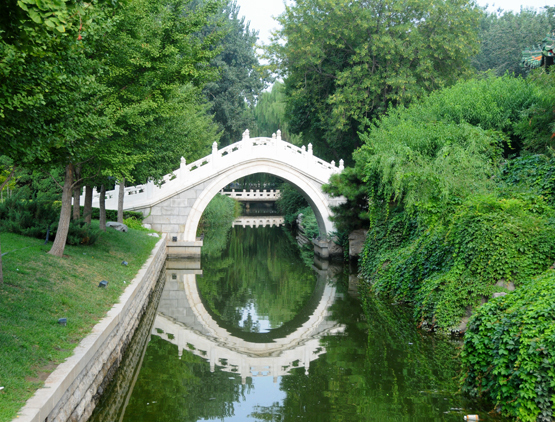 Like the loss of the Forbidden City from new changes and influences, China itself began to be influenced by outside powers. As early as the mid 1600’s a small church was built in Beijing by Europeans. It was destroyed several times by earthquakes but eventually was replaced by a large cathedral that was completed in 1904. 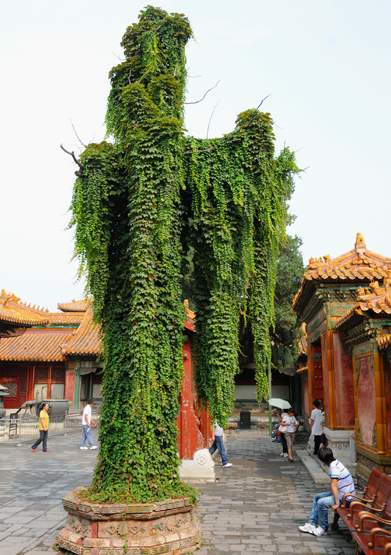 Since this place of worship has fallen and been rebuilt so many times many consider it to be China’s first church. 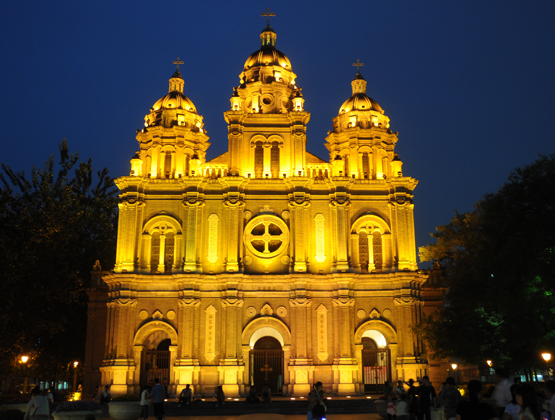 The building is named St. Joseph’s Cathedral and is also called Wangfujing Cathedral after the district it’s in. 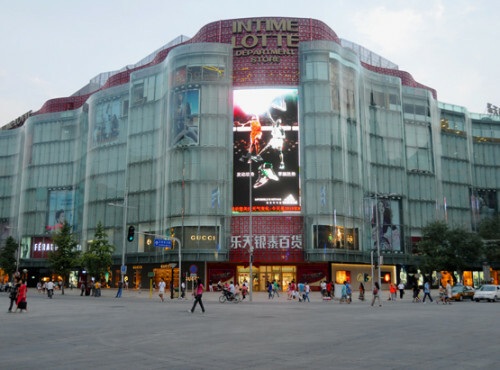 The Wangfujing district is Beijing’s most famous shopping and entertainment district. 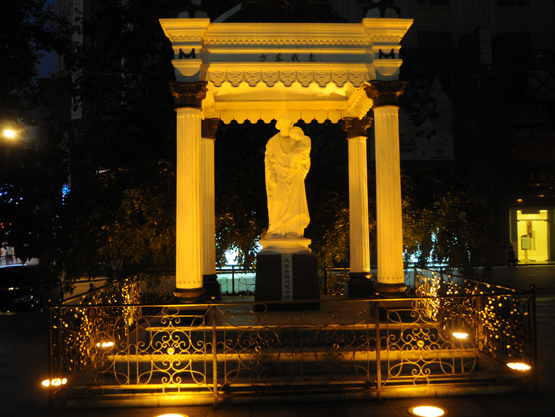 In two other dynasties this same district was a commercial hub as well as a place where upper class citizens lived. Above are two of the main buildings in the district. 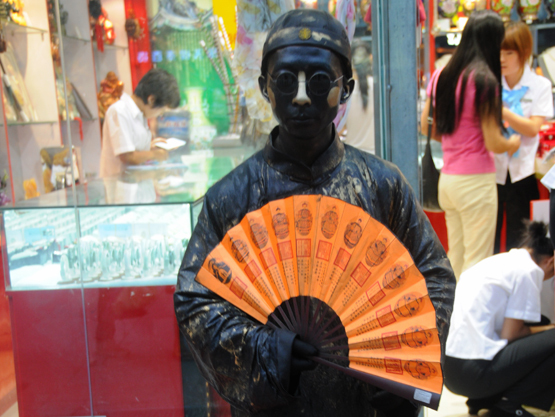 Below is a street performer on the left and one of the streets lined with shops and restaurants down below. I never did come out here past midnight but I imagine there is always something going on in the Wangfujing district and you’d never be bored. 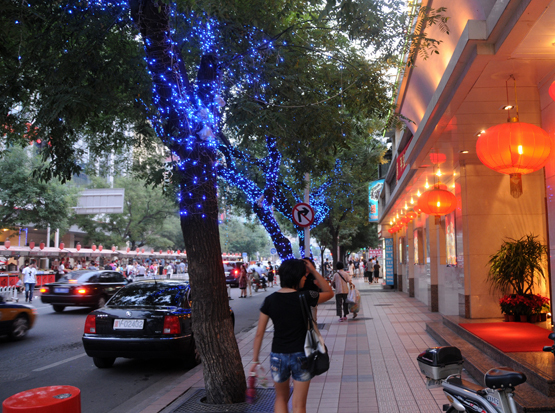 The scam artists girls accompanied me through Wangfujing district. 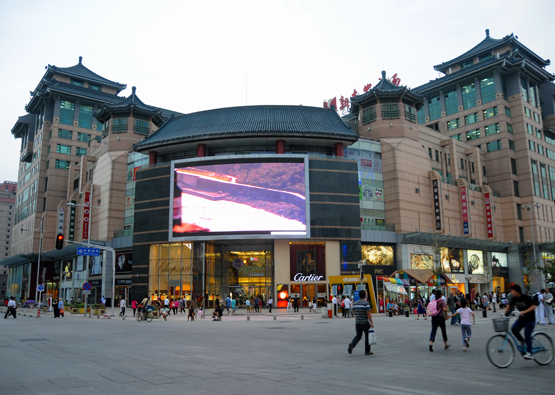 Also part of Wangfujing is a food market called snack street. 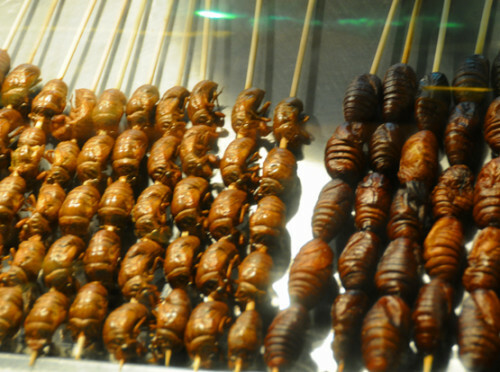 There is lots of exotic cuisine to choose from and many things you won’t find in the western world. The bugs are the most obvious ‘snack’ you won’t see back home along with the scorpions. 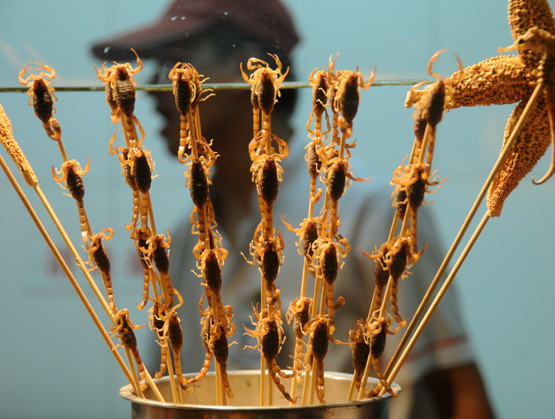 The scorpions were all still alive and squirming about on their sticks. Once you purchase one it’s dipped into hot grease then it’s all yours to enjoy. Despite my travels I’ve never been too adventurous when it comes to trying strange foods like deep fried bugs. Some people might find this the highlight of their trip. To me this area would have been more appropriately named fear factor street rather than snack street.